FAYETTEVILLE, Ark. 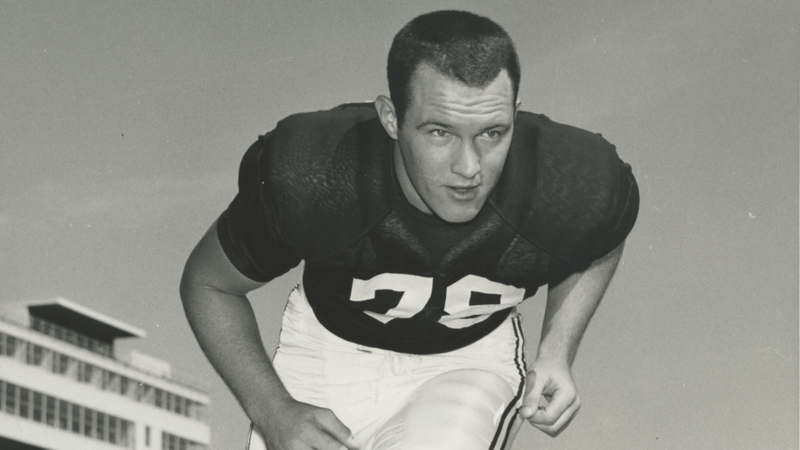 – Glen Ray Hines Sr., the first offensive tackle in University of Arkansas history to earn All-America honors (1965) and a member of the program’ 1964 National Championship football team, passed away in Fayetteville on Friday at the age of 75. A native of El Dorado, Arkansas, Hines was a mainstay in the middle of the Razorbacks’ offensive front during Arkansas’ historic run in the mid-1960s. A three-year University of Arkansas football letterman and helped lead the Hogs to a 25-7 record in his tenure, including an 11-0 record in 1964 on the way to a national championship. He was also a part of a school-record 22-game winning streak. Hines was a consensus All-American in 1965, recognized by the American Football Coaches Association, the Associated Press, the Football Writers Association of America and the Walter Camp Foundation. He also earned All-Southwest Conference (SWC) honors in both 1965 and 1966. The Houston Post named Hines the Southwest Conference Most Outstanding Player for the 1965 season. He was selected to the SWC All-Time team in 1996. Hines was also named Coaches All-American Game; College All-Star Game and the Hula Bowl. A member of the UA All-Century team, Hines was named to the Razorbacks’ 1960s All-Decade squad. Hines went on to an eight-year professional football career with Houston, New Orleans, and Pittsburgh. Throughout his time in the NFL he played in 115 consecutive games, including three playoff games, showing his durability as a player. Hines was an AFL All-Star game selection in both 1968 and 1969 before retiring in 1973. He was named a member of the Express News – San Antonio, All-Time SWC Football Team 75 years of SWC First-Team Offense in July 1989. In the December 2005 issue, Hines was named to the Football Digest All-Time Oilers Team. He was inducted into the UA Sports Hall of Honor in 2001 and the Union County Sports Hall of Fame in 2012. In 2018, Hines was inducted into the Southwest Conference Hall of Fame.